Because they live ensconced in a rigid shell, turtles display few outward signs that they are carrying eggs, which is why it is wise to keep an egg-deposition area in female turtle cages at all times. You can gently palpate them, which may reveal the presence of eggs, or you can watch for behavioral clues that indicate that your turtle is gravid, or carrying eggs. However, the best way to determine whether or not your turtle is carrying eggs is by having your veterinarian X-ray her. Red-eared sliders (Trachemys scripta elegans) exhibit different reproductive tempos, depending on the environmental condition to which they are exposed. Therefore, while some general trends are apparent, slider turtle reproductive timing varies. Typically, those living in the southern end of their range, where temperatures are warmer, emerge from hibernation earlier, which allows them to breed sooner; the opposite trend occurs for those populations living at northern latitudes. Slider turtles emerge from hibernation in February through April, depending on the location. Slider turtles begin courting and breeding soon thereafter, from March to July. The gestation period of the turtles lasts about three months, but this is quite variable. After the turtle deposits the eggs, they incubate for about 60 to 90 days, when kept between 81 and 86 degrees Fahrenheit. Some individuals may produce one or three more egg clutches over the course of the summer and early fall. 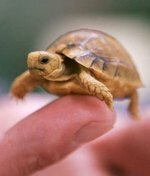 To palpate your turtle, pick her up and hold her gently. Using a very delicate touch so as not to harm the eggs, press the soft areas near the rear legs, between the carapace and plastron. If she is gravid, you may be able to feel the sides or ends of the eggs. Slider turtles produce clutches of between 5 and 20 eggs, but you will only be able to feel a few of the eggs by palpating her. Nevertheless, manual palpation is not an ideal method for verifying the reproductive status of your turtle. Even professionals may damage eggs, and it is possible to miss the eggs entirely, leading you to think your turtle is not gravid, when, in fact, she is. Gravid turtles often bask for longer than normal, although this can be difficult to appreciate through casual observation. In the early stages of the process, they are likely to eat voraciously, but as the time of egg deposition nears, she may begin to refuse food. Once it is time for her to expel the eggs, she may pace the tank frantically or dig through the rocks at the bottom of her tank. If you do not provide a suitable nesting location, she is likely to release a few eggs into the water. If you suspect that your turtle may be gravid, which can even occur when they do not cohabitate with males, visit your reptile-oriented veterinarian. Your vet will likely take an X-ray of your turtle's body, which will reveal the presence or absence of eggs. Additionally, the X-ray likely will indicate the number of eggs in her abdomen and allow your vet to determine if any of the eggs look problematic.